A solo album in the truest sense, music and lyrics written and arranged by Stewart Bell, as well as the artwork and design, keyboards, drums and much of the vocals. Stewart uses the name of his band, Citizen Cain, to no doubt gather a little additional traction but this is a good fit amongst CC’s discography of five albums. 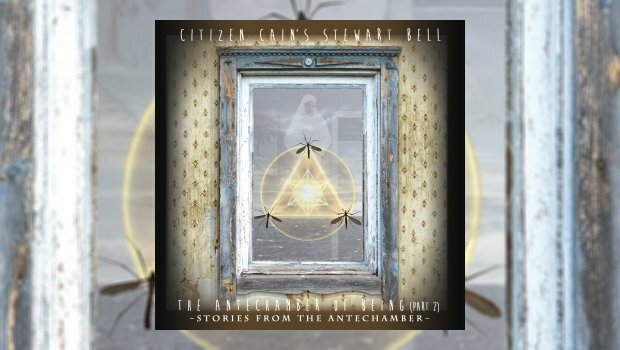 Stewart has been the main composer and keyboardist with Citizen Cain since the early ’90s, and after 2012’s Skies Darken he decided to pursue a solo path, this autobiographical concept providing the perfect launch pad. With the first part of a proposed epic trilogy released in 2014, this second part is a collection of stand-alone stories from Stewart’s lifetime of experiences as a lucid dreamer, the strange phenomena of consciously being aware of one’s dreams and able to direct them to some extent. With Bell doing most of the work, several guest vocalists appear to play various additional characters as the listener is once again taken on a vivid journey through the inner realm of the mind of ‘The Dreamer’, played by Simone Rosetti of The Watch, and his mentor, ‘The Teacher’, performed by Phil Allen who also contributes the guitar parts, via a series of anecdotes relating to events that played an important role in the story of the first album. Rosetti’s Peter Gabriel-like voice sometimes makes the music feel like it could have come from The Lamb Lies Down on Broadway, but despite this particularly heavy and recurring Genesis reference, Stewart does a good job in ensuring that there is variety and interest in the music throughout, and despite the obvious ’70s influences there is often a more modern edge. Granted, one of the recurring keyboard lines of Intervention will immediately conjure up ‘early Marillion’ for anyone of the right age, but it would be an injustice to criticise this as the breadth and scope of the keyboard use – from orchestral to piano (electric and acoustic) to synth textures to full-on widdly-wee soloing – dispels any notion that it was used for anything other than its intrinsic sound. Stewart plays ‘The Shadow Self’ and Bekah Comrie is ‘The Dream Girl’, ‘White Figure’ and ‘Voice of the Universe’. Starting in a very dark place with an impressive choral part, the first four pieces comprise The Early Days Suite which describes exactly that, the lyrics and accompanying notes relating how Stewart began to learn lucidity techniques to overcome nightmares as a child, as taught to him by his older brother. The events of these early days are extended in the bonus track The Cupboard Of Fear, a remix of Decoherence from the first album, which recalls Stewart’s first ever lucid dream, at age 6. It features Arjen Lucassen as ‘The Higher Self’, Phil Allen as ‘Big Brother’ and Stewart as ‘The Monster’ but, if anything, this lengthy bonus piece feels a little out of place and different in structure – not that there is anything wrong with it – so it is probably best to keep it at arms length from the rest of the album which works very well as a unified whole, building to a suitably epic conclusion with The Probability of Improbability. The restrained and unsettling intro parts to The Early Days Suite gives way to the rollicking W.I.L.D., then back to the ominous First Awareness, Rosetti playing a blinder throughout. Time Dilation covers the anomaly that time within dreams can be extended or condensed beyond the normal parameters of the real world via a couple of Stewart’s personal experiences and how people can seemingly meet while dreaming. There’s intensity and unexpected shifts, Bekah Comrie (as ‘The Dream Girl’) and Phil Allen in excellent supporting vocals for a rollercoaster of a piece that ends with a stately conclusion. Intervention describes the phenomenon of sleep paralysis as Stewart questions whether he is actually looking to find the coincidences which occur. The quality of the vocals is again impressive, the keyboard lines and some excellent guitar riffs are well integrated in a rock solid structure as the tension ramps up in the second half. The Probability of Improbability covers Stewart’s quest for meaning and something “more”, and is probably the high point of the album. Bekah’s vocal melody is beautiful, a lovely counterpoint to Simone’s more subdued lines in the early stages. Hammond organ raises the intensity and the instrumental interplay is excellent, the mood shifting all the while to a crescendo of unusual ‘stabby’ keys that builds from a simple duet of Rosetti and piano. The subject matter is intriguing enough but it is delivered with crackling energy and drive through well staged set pieces and instrumental flights of fancy with a rock opera edge. The concepts may be heavy going for some but the music can easily be taken on its own merits as all the performances are noteworthy and Stewart has pulled it all together with aplomb. I have to admit that having listened to Part Two I went back and investigated Part One, only to find it considerably lacking in comparison. It would be a shame for anyone with whom Part One did not resonate to miss out on this second volume as it is a more accessible work with some fantastic melodies, and to my ears sounds more fully realised with higher production values, perhaps as a result of additional funding coming from the first release. This is a no-brainer for any fan of Citizen Cain as the almost demonic intensity, particularly in the guitars, harks back to the best moments of the parent band. The textures move from metallic to atmospheric and the detail inherent in the complex compositions give it the legs to stand up to repeated playing and retain the interest – there’s plenty to hear. The different qualities of the voices used gives it a theatricality that successfully remains far removed from ‘Am-Dram’ or the excesses of a traditional musical. The message is central but the music as the vehicle for its delivery is crucial to its success and Stewart is to be applauded for keeping it fresh and compelling. The expansive booklet is well laid out and an interesting read with Stewart adding plenty of background detail to help the listener get the most out of the songs. It’s a concept that you can get lost in, but this is not essential as the music speaks for itself.